Dawn's Crafting: Woopsy, only 12 hours late with my Blog Candy Winner! 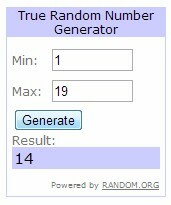 Woopsy, only 12 hours late with my Blog Candy Winner! I'm so sorry, I completely forgot about my blog candy today! did some ironing, got crafty & then did some home DIY with hubby! as well as varnishing some doors. We also had to wait in for our old sofa's to be collected by the charity shop people! I can't tell you how good it feels to have a little bit of space back in the house! So now, without any further ado let's get down to the business in hand! There were 20 comments on my candy post. just to keep it fair! Mr Random .org was called upon to make a selection! & I'll give you the voucher code! A Little Bit Of Candy!